MORE ABOUT Home Mattress Center: Tom McKenney & Mike Doyle: Tom is working on his 20 th year at Peoples Plaza. Mike has been here for 5 years and with the company for 20 + years. Home Mattress opened at this location on February 11, 1989. When Tom got here on September 19, 1991 he could look out the side window and watched as a Circus was being set up in the field outside. Wow has times changed. 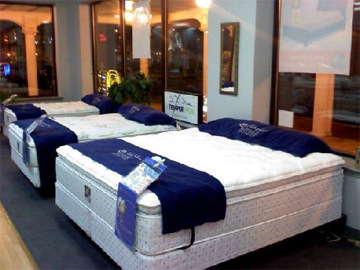 We sell top quality mattresses including Sealy, Stearn's and Foster, Simmons, Serta, Englander, Symbol, and Tempurpedic. We are proud of being a part of this successful shopping plaza. Home Mattress Center also has store locations on the Kirkwood Highway (across from AC Moore & Kohl's), Concord Square Shopping Center (between Borders & Giant), and a close out/discount store in front of the Farmers Market in New Castle).